Here is a picture of the Stegosaurus dinosaur stamp. It was issued in 1965 by the small republic of San Marino (located on the Italian peninsula). It had a value of 10 lire but the country now uses the euro as their currency. The stamp was part of collection of nine issued that year. 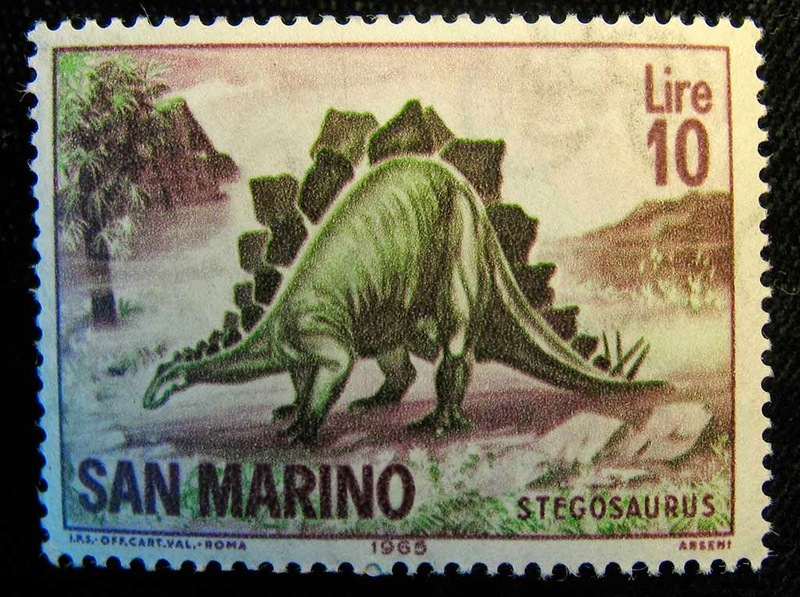 The United States issued a stamp for this dinosaur in 1989 (see my blog post about it here). The Stegosaurus existed in the Late Jurassic Period (155-150 mya). The fossil was named by Othniel Charles Marsh in 1877. San Marino is a very small country located inside of northern Italy. It is about 61 square kilometers in size with a population of about 30,000 people. One of their chief sources of income is tourism. They sell stamps and coins to tourists. More than likely these dinosaur stamps were part that income stream.